In fact, I rarely drink egg nog. My dad makes a killer version laced with brandy. The holiday book club meeting featured a silver tureen of the rich creamy treat, with freshly grated nutmeg perfuming the kitchen. A master chef/mixologist friend hand-crafts each mugful to order, then reverently delivers the resulting brew to each guest with a flourish. The aroma of vanilla mixed with the holiday spices instantly conjures up the warm and cosy feelings of the season every time. "Ugh. I'm drinking alcoholic melted ice cream. Where's my vodka tonic?" 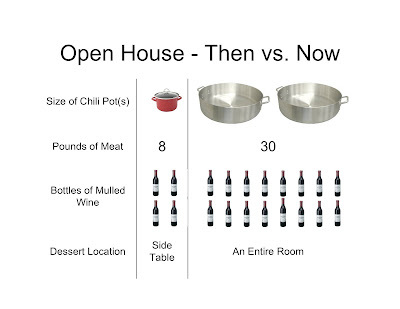 That's why I'm such a fan of cooking with the stuff. Egg Nog French Toast. Egg Nog Pound Cake. And my new favorite*, Egg Nog Pumpkin Pie. This was a revelation. The custard texture is unusually light, practically melting in your mouth, and the depth of flavor that comes from the spices, the egg nog, and the pumpkin is spectacular. Mix all ingredients using a wire whisk. Pour into crust. Cover edges with a crust protector or tin foil to prevent edges from burning. Bake at 425 degrees for 15 min. Turn heat down to 350 degrees and continue baking for 45-55 min until a knife comes out clean. Cool on wire rack for 2 hours. Refrigerate. Take out 1 hour before serving to warm pie to room temperature. Slice and garnish with fresh whipped cream, dusted with a bit of cinnamon sugar. Makes two 10 inch pie crusts - you only need one for the pie, but you'll definitely find a use for the other one. Or, cut the recipe in half. A few secrets for the perfect crust are to use very cold butter, shortening, and water and touching the dough as little as possible with your rolling pin and your hands. If you don’t have the time to make the crust from scratch then a store bought crust works nicely under pressure. Mix the first 3 ingredients in a food processor bowl by pulsing a few times with a steel blade. Add the shortening and butter and pulse 10-12 times until well blended so the fat will look like pea sized pieces, and the rest looks like coarse crumbs. While the machine is running, add 5 Tbs. of ice water down the feed tube and pulse the machine until mixture looks evenly moistened and begins to form small balls. Add remaining 2-3 Tbs. of ice water, 1 Tbs. at a time, until dough holds together and begins to form a ball. Turn dough out onto lightly floured surface and knead just until it comes together completely. Divide in half and form two flat discs. You can wrap these up and freeze individually at this point, or store in the fridge for several days. Roll dough out between sheets of waxed paper to 12” round and 1/8” thick. Peel off one side of the waxed paper, fold the dough in half, and transfer to pie plate. Transfer plate back to the fridge for 30 minutes or up to several hours before filling and using in your favorite recipe. If you are using the other portion for a top crust, roll that one out, too, and keep refrigerated in the waxed paper until ready to use. * Full credit to my friend Michelle, who was raving about this pie at our Open House, and kindly sent the recipe by e-mail just in time for our Christmas dinner. 4. My daughter bursting with excitement and beaming with happiness as each of her carefully chosen items was unwrapped and exclaimed over. With a limited budget, she'd spent the week planning and shopping and wrapping and thinking about everyone in the family. A football for her brother. A coffee mug for her aunt. A gift card to the grocery store for my mom. Hand-drawn cards and tape all over every present. In one wriggling body, she epitomized the whole idea of this magical day: It's truly better to give than to receive**. A tradition in our house for years. Must serve with at least 3lbs of bacon. "Sharon and Diane, we have just spotted Santa and the reindeer off on our right hand side. He's headed for San Francisco, and it looks like he had quite a few things for you on the sleigh!" My uncle Daniel spending about 25 minutes arranging the entire extended family into a group for the annual Christmas photo. The kind where he had to push a button on the camera, run like mad to get into the picture, and then everybody froze for what seemed like another hour until the flash finally went off. Then we could have ham, dinner rolls and butter. Rushing up the stairs to find my cousin so we could flop down in her room, try out all her video games (Pong!) and listen to Casey Kasem's Top 100 countdown of the best songs of the year, giggling and dancing around like maniacs. Making and decorating cutout sugar cookies every year*. Once, I decided to only make dove shapes, and decorated our entire Christmas tree with nothing but a huge flock of frosted birds and sparkly white lights. Lou Rawls singing Little Drummer Boy. All the Rankin-Bass Holiday specials, especially Rudolph. In the midst of all this joy, there is one memory that makes me ill to this day: Oyster Stew at midnight. We would all gather at my aunt's dining table, and my grandmother would lift the lid on a silver soup tureen and ladle the steaming stuff into porcelain bowls for each of us. I stared down into a pool of warm cream, with flecks of melted butter scattered through it. Floating languidly within were at least three and maybe six grayish black chewy globs of gelatinous fishy grossness: Oysters. The grownups around me would sip and smile with pleasure at the rich and decadent treat. I would look longingly at the dessert tray filled with little cookies and wrapped chocolates and hate my life. My mother glared at me until I hesitantly lifted my spoon and allowed a drip of broth into my mouth with a grimace. My sister was gagging silently beside me. It was torture. To this day, I avoid oysters like the plague. But I'm all about dessert trays filled with cookies and wrapped chocolates. As a mom, I've tried to avoid giving my children Oyster Stew memories, and focused on making positive ones. We write a note that everybody signs. We bake snickerdoodles and pour a big mug of milk for Santa**, leave hay and carrots for the reidneer, and the kids and my husband camp out on the floor hoping to catch the jolly fellow in the act. And if I do make a Christmas Eve dinner that features a stew with fish in it, we have a grilled chicken alternative available. 1 lb. boneless skinless chicken tenders, cut into 3/4" pieces. In a large pot, saute the sausage over medium heat until brown, about 15 minutes. Remove from pot and set aside. Add 2-3 Tbs. of olive oil to the pot. Add the okra and cook over medium heat until slightly soft, about 10-15 minutes. Add another 2 Tbs. of olive oil to the pot, then stir in the onions, bell peppers, and garlic. Stir and cook another 10 minutes. Add the chicken stock, tomatoes, cumin, cayenne, 1 tsp. salt, 1/2 tsp. black pepper and bay leaf. Simmer, uncovered, for about 30 minutes. As that simmers, get the add-ins ready. Toss the rock shrimp with the Cajun seasoning in a small bowl. In another bowl, combine the flour, 1 tsp. salt and 1/2 tsp. of black pepper. Toss this mixture with the chicken tenders. In a large saucepan, melt 1 Tbs. butter. Saute the shrimp in the butter until pink. Add the shrimp and any juices in the saucepan to your gumbo. Add 1 Tbs. of olive oil and 1 Tbs. of butter to that same saucepan. Add the contents of the chicken bowl (including any extra flour) to the saucepan, and cook over medium heat until chicken is browned and just cooked through. It is OK if the flour browns and clumps, too. Scrape every little bit into the gumbo pot, and this will help thicken the gumbo. Add the sausage back into the pot, and stir in the crabmeat and parsley. Allow to heat through, taste to adjust seasonings, and serve. Goes well over rice with crusty french bread. Note: Use this recipe as a guideline. Feel free to change up the types of seafood or sausage that you use, go overboard on an ingredient that you love, or add your own spin on it. That's what I do! * We still make these cookies every year. It's the fifth constant of the holiday open house that there is always cookie decorating. Cream butter and sugar. Dissolve baking soda in a mixture of the vanilla and the milk, then blend this into the creamed mixture. Gradually blend in the flour. Refrigerate dough for several hours. Pre heat oven to 350. Working with portions at a time, roll out on lightly floured surface until 1/4" thick. Cut into shapes with cookie cutters. Bake on parchment paper or silicon mat covered cookie sheet for 6-8 minutes, or until edges are just beginning to brown. If you are making ornaments, poke a hole with the end of the skewer in the top of the cookies right when they come out of the oven. Decorate and enjoy. Makes lots and lots of cookies. ** I am envious of a friend's tradition, which holds that Santa likes a nice glass of red wine and fine chocolate. Yes, an entire room full of nothing but dessert. And the dessert room this year was, I have to say, the best ever. My mom, my sister and I begin baking days before the party. There are old standby's that return every year, like the Mini Pecan Tarts and the Cranberry Coconut Chews. Something for the chocoholics, represented this time by Kahlua Bars and the Mom's Brownie Cookies. A tangy double lemon shortbread. A cookie full of Christmas spices: the luscious Ginger Hermit Bars with Brown Sugar Icing. My sister's latest find, and crowd favorite: Million Dollar Peanut Butter Cookies. 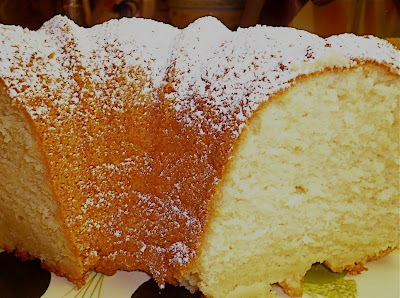 Then the show stopper: A Cream Cheese Pound Cake, baked just before the party and served warm from the oven. My sister: Did you ever see the cookies that won the Pillsbury Bake Off? This lady won $1 million for them. I couldn't believe that any cookie could be worth that much money, so I made them for my students**** as a test. And you know, they were really good. Maybe not a million bucks good, but seriously tasty. We should make them for the party. 1 package Pillsbury® Simply® peanut butter refrigerated cookies, well chilled. NOTE: You must keep dough very cold until you use it. In small bowl, mix chopped peanuts, granulated sugar, cinnamon and 1/4 tsp. salt; set aside. In another small bowl, stir peanut butter, powdered sugar and 1/4 tsp. salt until completely blended. Shape mixture into 24 (1-inch) balls. Cut each piece of cookie dough into two pieces, making 24 pieces total; flatten slightly into small discs. Shape 1 cookie dough piece around 1 peanut butter ball, covering completely. Repeat with remaining dough and balls. Roll each covered ball in peanut mixture; gently pat mixture completely onto balls. NOTE: My sister likes big cookies, so she formed 18 balls and made 18 pieces of dough instead of 24. On ungreased large cookie sheets, place balls 2 inches apart. Spray bottom of drinking glass with cooking spray; press into remaining peanut mixture. Flatten each ball to 1/4-inch thickness with bottom of glass. Sprinkle any remaining peanut mixture evenly on tops of cookies; gently press into dough. Bake 8 minutes or until edges are golden brown. Cool 1 minute; remove from cookie sheets to cooling rack. Store tightly covered. People will love these so much they will chase you through a crowded house and give you dinner invitations in exchange for the promise of the recipe. So easy that it was featured in my Clueless Dad's Cooking Class. But so good I've kept it a secret until this post. Merry Christmas! Preheat oven to 325. Grease one bundt pan and set aside. With an electric mixer, cream together the butter, cream cheese and sugar until light. Stir in the vanilla and almond extracts. Add the flour and eggs alternately, beginning and ending with the flour (first add one cup cake flour, then three eggs, then 1 cup cake flour, then three eggs, then one cup of all purpose flour) mixing well after each addition. Pour batter into prepared pan. Bake for 1 hour and 15 minutes, or just until a toothpick inserted into the center comes out clean. Try not to overbake. Cool for a bit, then slice and watch people roll their eyes with pleasure. If you want any of the other cookie recipes, leave a comment! 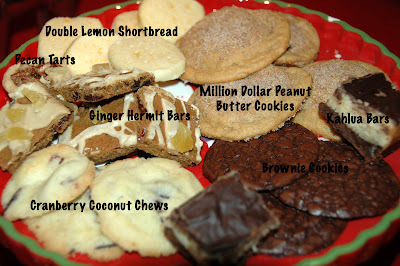 I will post the recipe for the cookie that gets the most requests by the end of the year. * Yes, I am lucky enough to have a friend who owns and operates a mini-doughnut store in Venice, and she brought her mobile cart to the party one year. Piping hot, cinnamon sugar covered heaven in my house! Tough to top that. ** One year, two guys I had never met showed up at my house with a PC in the trunk of their car that they wanted to show me. I tottered out with my mulled wine in hand, listened, mystified, to a few songs in the front seat, then invited them in for a bowl of chili. We wound up building and running a company together for the next six years. *** Actually, there are four constants. The fourth is that I will be suspended precariously from an extension ladder somewhere in the yard hanging Christmas lights as the first guest arrives. Said guest, horrified but too polite to refuse, will then be pressed into service completing my crazed perfectionist decorating scheme even though they really just wanted to get a drink and relax. **** Wouldn't you like to have her as your psych professor? "As many of you know, I am a loose Jew - definition: not very religious. I am also a hungry Jew and I absolutely love the foods of Hannukah (minus the noodle kugel.) This year I would like to celebrate the beginning of Hannukah with an early morning* Latke making party. I will be divulging my grandmother's recipe to all in a very relaxing impromptu setting." Understated as usual, this was more than a casual lesson in the finer points of shredded potatoes. There was a delightful salad and a breathtaking pear tart, too. Not to mention great conversations and laughter with friends in a kitchen that felt like an island of warmth on a gray day in December. All in all, my one morning of Hannukah was a testament to what this holiday is all about. Grate potatoes and the onion. A food processor makes this go really quickly. Transfer to a plain kitchen towel or a large portion of cheesecloth, wrap up, and squeeze like crazy to get all the liquid out. Take your time and make sure the mixture is completely dry before you move on. Crack the egg into a large mixing bowl and stir with a fork to blend lightly. Add the potato/onion mix, 2 Tbs. of flour, the chicken broth powder, salt and pepper. Mix by hand until well combined, adding flour as you go to keep the mixture from getting too moist. Heat up a non-stick frying pan, and add enough canola oil so you have a thin layer covering the bottom. Form potato mixture into thin patties, about 2 1/2 inches across and 1/3 of an inch thick (any thicker and the middles won't cook through). When oil is hot, add patties and cook about 5 minutes per side, or until deep golden brown. Taste one after frying your first batch to make sure you like the seasonings. Continue to fry in batches, keeping completed latkes warm, uncovered, in a 200 degree oven if they are not getting eaten up immediately. Serve with homemade applesauce and horseradish creme fraiche. Combine all ingredients in a medium saucepan. Simmer over low/medium heat for 1/2 hour. Lightly mash, so it's applesauce-y but still chunky, then continue cooking until most liquid has evaporated. Remove cinnamon sticks and serve. Put creme fraiche into a small bowl. Stir in horseradish, a teaspoon at a time, tasting as you go until it is just right. All measurements are approximate, so trust your taste buds! Using mini food processor, chop the garlic a little more, then add remaining ingredients and blend well. Taste and adjust seasonings. Serve over arugula with shaved Parmesan, or crisp Romaine lettuce with garlic croutons...it's good on anything! Preheat oven to 400. Roll out puff pastry, and lightly dust with flour. Cover baking sheet with parchment paper, then transfer puff pastry to the sheet. Arrange pear slices on top, leaving a border of pastry all around. Sprinkle the sugar over the pears, then dot with the butter dice. Bake for about 1 hour, until edges are puffed and golden brown. Stir together in small saucepan over low heat until smooth and slightly warm. Brush gently over the tart when it comes out of the oven. Allow tart to cool just a bit. Dust with powdered sugar just before serving. * I love this woman because, like me, her definition of early morning is 9:30. ** Although I would have been tossed back out when I was caught in my car on the way home singing along to Peggy Lee's definitive version of "Santa Claus is Coming to Town" at the top of my lungs. *** These usually have MSG, so the veggie stuff is better if you can find it. If you use the chicken version, start with 1/4 c. and add more as needed. Like almost all other advent calendars I've ever seen, it counts the days until Christmas*. Since her actual advent calendar is in storage**, she and her dad came up with an idea to take things she already had, put them in groups and use those groups to count down to the big day***. When she got to 16 she stopped and looked proudly at their handiwork. Puzzled, her mom reminded her that Christmas was on December 25th. "I know that, Mommy!" she said. "My advent calendar is a countdown to California." Can you spot my dog in the calendar? He is part of the day 8 group. Did I mention they'll be here on the 16th? I know because our advent penguin is on the case****. * I finally learned to put the treats in each cubby one day at a time. Otherwise my kids just opened all the doors on December 1, stuffed themselves and got irritated when I didn't refill them. Then I got irritated with them and the whole Christmas spirit thing was kind of lost. ** They are still in limbo as my brother-in-law house hunts in DC while my sister and niece hang out in Michigan. *** Each day they take those items and pack them for the trip. We've all been victims of fashion, as much as we hate to admit it. We try to ignore the reports out of New York, but we're intrigued and jealous, then elated at an LA sighting. We guiltily search the Web and ogle the celebrity clientele . We mock the lines in front of the boutiques while we search desperately for a parking place. We ridicule the prices, even as we fork over our hard earned cash and hate ourselves for it. We starve ourselves before we buy. We judge guests by the type of shopping bag they tote, and secretly scan a hostess' closets for signs of the source of her finery. Finally, as the trend goes from hip to ridiculously overplayed, we turn our noses up at the numerous imitators, the wanna-bes on every corner. After so much exposure, we may even begin to tire of the whole thing and wonder what we were thinking in the first place. I speak, of course, of designer cupcakes. The $5-a-pop creations in the oh-so-precious eco-cardboard carton with a perky sticker or lovingly tied raffia ribbon, replete with adorable crowns of cream cheese icing as thick and heavy as wet sand. Vintage red velvet is suddenly all the rage again. And the colorful fondant buttons? So CUTE!!! So last year. I hear everyone's moved on to macarons these days. Except Mom. Her mini cupcakes are nobody's fashion statement. She's been making them for years. They only come in vanilla. They only come on your birthday. They are timeless classics, and they are the best*. Preheat oven to 350. Spray mini muffin trays with baking spray and set aside. This recipe literally makes close to 100 mini cupcakes, so hopefully you have a bunch of these trays on hand, or you can work in batches. Buy one package of butter recipe yellow cake mix. You can use Betty Crocker or Duncan Hines, whichever one you have a coupon for. Follow the directions on the box, except use whole milk in place of the water, and add about a teaspoon of vanilla extract to the batter**. Using a small ice cream scoop, fill muffin tins about 2/3 full with batter. Bake for about 12-15 minutes, until light golden brown. Remove to cooling racks and let stand. Buy a box of C&H powdered sugar. Follow the recipe for buttercream frosting on the back of the box except add a bit more vanilla than they call for. Also, soften the butter a lot so you can mix the frosting by hand with a wooden spoon. * Plus you can get about 100 of them for the price of two sugar bombs from Sprinkles. If you have the right Mom. And the cake mix and powdered sugar are on special. ** Mom was also way ahead of The Cake Mix Doctor, who built an entire empire on this idea. *** Always desired by my kids. Specific citation from Google: My prior post about this particular propensity for misspelling, also cited in another post about a recent site visitor from India on a similar quest. Just for fun, I'm posting this to see if it goes around one more time. The curative powers of chicken soup are universally acknowledged, as is the classiness of having a small cup of bisque as a starter to an evening meal out. But now that the days are getting shorter, nights are getting colder, and December is officially here, I'm all about a different kind of magic in a bowl: Soups that are a meal unto themselves. 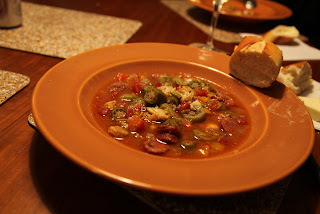 Hearty chowders laced with bacon and potatoes, thick black bean soup with spicy chorizo, rich lentil soup with kale and sausage, Tuscan bean soup swirled with pesto. Soups that don't get garnished with a dainty sprig of parsley, but with a generous amount of Parmesan or a spoonful of sour cream. Soups where the dinner plan is putting bowls out next to a bubbling pot on the stove with a big ladle, heating up some crusty bread or baking a few corn muffins, setting out condiments, and passing around the spoons. As the spoons dip deep, the goodness in the bowls will slowly spread inside the people around the table, then flow out among them, until the whole room is relaxed and smiling* and basking contentedly in the warmth that has filled up the place**. With a few notable exceptions***, this kind of soup is best at home. There are recipes that take days and days****, and some that you can make in a Sunday afternoon. Of course, there's takeout that you can warm up in 10 minutes. And then there is this family favorite that's ready to go in about an hour, especially if you have some handy helpers in the kitchen to chop the veggies for you. The original recipe came from our childhood next door neighbor, Mrs. Schneiders. We loved the name because it conjured up images of little cheeseburgers floating around in there somewhere. I modified it to add sausage, because, well...everything tastes better with sausage. In a large soup pot or Dutch oven, brown the meats in the oil, breaking them up as you go. Drain excess fat. Add the salt, pepper, basil, oregano, seasoned salt and onion soup mix. Stir in water, tomato paste, diced tomatoes and soy sauce. Cover and simmer for 10 minutes. Add celery, celery leaves, carrots and lentils. Bury the rind of Parmesan in the soup. It will add really great rich flavor without melting all over the place. Continue to cook over low heat, partially covered, for about 45 minutes, or until lentils are cooked through but still firm. Every once in a while, take a big spoon and skim of the foam that rises to the top as it cooks. Meanwhile, separately cook pasta in boiling salted water until just barely done*****. Drain and set aside. About 10 minutes before serving, stir pasta into the soup, taste and adjust seasonings. Before you ladle out the soup, remove the Parmesan rind. Serve with a generous sprinkling of cheese on top, and pass chili flakes around as an option for those who like them. * Except my son, who has discovered that I have yet again put vegetables in his bowl that need to be fished out individually with dramatic sighs, thereby harshing his buzz. ** This is why meal soups are generally a winter phenomenon. Who wants to bask in extra warmth and glow when it's 105 outside? *** When I lived in NY, there were two great places where soup was the entire focus of the meal. One was Soup Kitchen International, home of the famous Soup Nazi on Seinfeld. He truly did have an incredible crab bisque. The other, which is still going strong, is Le Bonne Soupe. They make the world's best French onion soup, as far as I am concerned. Lunch there includes a small salad with excellent, garlicky vinaigrette, an utterly fresh portion of a perfect baguette, a bowl of one of their signature soups, and a perfect little serving of chocolate mousse for dessert. Everything is fantastic and it's one of the best deals in town. I make a point of going every time I visit if I possibly can. **** When my husband and I were still dating, he feel ill one day and asked if I could make him some soup. Of course I said yes, and asked what kind he wanted. He feebly croaked, "minestrone". I pulled out my copy of The Silver Palate cookbook, and looked up the recipe. It began with, "Roast your beef marrow bones for 6 hours to prepare the stock." Fool that I was, I followed every singe step to the letter, and proudly served him a bowl of homemade minestrone soup three days later. He nearly died waiting, but married me anyway. ***** When soup recipes call for pasta, I always cook the pasta separately and add it in at the last minute. Otherwise it will absorb much of the liquid in the soup, upsetting the balance of things. A reader came to the blog this morning via a Google search for the phrase "naked pennies". The interest came from Bombay, India. Does anyone know if perhaps in Bombay "cheesy" is a polite term for "naked"*? * Probably more likely that this was a misspelling of pennies. But they did click through and stay a while! I neglected to mention the other reason I love to cook Thanksgiving dinner: the leftovers. But I have to confess that this is the one and only instance where I'm a fan. I'm ashamed to admit this because it goes against every single thing my coupon-clipping, special-grabbing, budget-tightening, bargain-hunting mother has been drilling into me for years. She never met a meal she couldn't stretch for a week or so*, and I know it causes her physical pain to see a container with my daughter's extra spaghetti Bolognese sitting for days in our fridge**. Some people indulge in real cream with their coffee, I splurge by only eating a meal the first time around. There, Mom. I've said it. I know I'm going to burn for it. Me: We're going to grab some dinner at the place down the street. Want to come? Her: No thanks. I'm all set. Her: My chicken sandwich from Tuesday, the mashed potatoes from dinner last night, with a side of Asian noodles and a lamb skewer that I found on the bottom shelf in some foil. Me: Ah ha. [My husband is turning pale and backing out of the door.] Are you sure you don't want to come? Our treat? Her: That's OK. Don't order dessert though...I have half a piece of chocolate cake here that should be plenty for the three of us to split when you come back. The dog scowls and eats his bare, dry kibble**. Mashed potatoes mixed with chopped scallions become crispy potato pancakes, topped with a dollop of sour cream and a slice of lox. They go perfectly with eggs the next morning. A dab of cranberry sauce between two shortbread cookies, sprinkled with powdered sugar, makes an elegant and tasty treat with a cup of tea. The turkey carcass tossed in a dutch oven with carrots, celery, onions, thyme and water to cover, bubbles into a rich and savory stock for risotto or turkey stew. And the turkey itself? Thanks to my sister's recipe****, we eat enchiladas, baby! Preheat oven to 350. In a large bowl, mix turkey, onion, sour cream, cilantro, 1 c. of the cheddar cheese, all of the pepper jack, and the spinach, if using. Season to taste with salt and pepper. Set aside. Pour enchilada sauce into a large sauce pan, add another canful of water, then stir in the seasoning mix and simmer until blended and warm. (If using green sauce, just heat). You are now getting ready to form and fill your enchiladas. What I do is create an assembly line near my stove. The first station is a large frying pan, where you heat about 1 tsp. of oil. Next to that is your pan of warm sauce. Then your bowl of filling, and right next to that on the counter is a 9x13 rectangular baking dish. Take a tortilla, and place in the frying pan to soften. Flip after about 30 seconds to soften the other side. Using tongs, carefully dip the softened tortilla in the sauce to coat. Then lay the tortilla in the baking dish. Spoon a good amount of filling into the middle of the tortilla, fold over the sides, then rotate in the baking dish so the fold side is down. Repeat with remaining tortillas, adding oil as needed to the frying pan as you go. If you have extra filling when you're done, just tuck it in around the enchiladas. Pour all of the remaining enchilada sauce over, and sprinkle with the remaining 1 cup of cheddar cheese. It will look really soupy, but don't worry! The sauce will be absorbed by the tortillas as they cook. Bake for 40 minutes, or until lightly browned and bubbling. Allow to sit for at least 10 minutes before serving. Garnish with shredded lettuce, chopped tomatoes (or salsa), guacamole and sour cream. * After getting the ingredients for 60% off, plus a double coupon and extra value points. ** Thus we are literal interpreters of the phrase "doggie bag". The day before Mom comes over, the dog happily helps us clear away any evidence of unfinished meals. The aforementioned spaghetti, pictured here, will be gone by 5 pm today. When my sister visits, the pooch is out of luck. *** My microwave is for softening butter, melting chocolate, and popping popcorn. My sister can whip up a seven course meal for her family (sometimes using new ingredients) in hers. **** The amount of cheese involved should be a clue that it is her recipe. ***** You can make these any time of year using a rotisserie chicken from the grocery store.